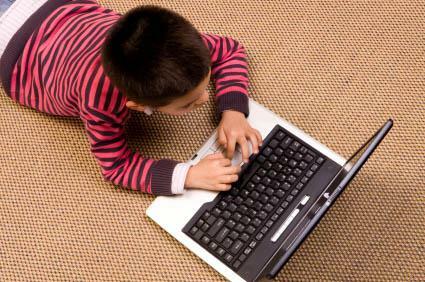 Typing games for kids are practical and fun activities that your kids can enjoy for years. Give them a headstart on their technology skills with techniques they can learn online. The keyboard is designed for speed when it comes to typing. The keys are not laid out in a random order. Instead the early typewriters, which were around in the late 1800s, were designed using a system that put the most frequently used letters in easy-to-find spots. That way, you could type as quickly as possible with an efficient layout. Notice as you look down on your keyboard and place your hands properly for typing that the letters "z" and "q" are far over to the left side and force you to lift your finger, whereas you are already touching "a" and "s." Show your kids this as you encourage them to learn how to type properly. Learning to type for kids is both a fun and a practical activity. As technology becomes more advanced, kids are going to spend more time typing and using computers. They will appreciate becoming fast typers and being able to communicate quickly through typing. The skill also helps with learning other activities, such as spelling, logic, and brain development. Kids who are starting school soon or already in elementary school will get a lot out of learning to type early. Most kids can start as soon as their fingers are big enough to fit properly on a keyboard, around ages 6 or 7. Many school assignments, even for young kids, require turning in typed pages, so it's good to give your kids a framework to build upon. A few minutes a day playing typing games for kids can give children an ability they will probably use for the rest of their lives. The Internet has lots of typing games for kids to choose from. These games can satisfy your child's desire to communicate and learn, as well as score points in a game. They are also easy to play and can be done by children of all ages. If your child can write and has big enough hands, he or she can learn to type. Learning to type properly can help kids get ahead in school and get better grades. As your children learn to type, make it an activity you can do together. Observe and encourage them to do the exercises and make progress. Set up rewards for typing faster, spelling correctly, and typing accurately. This will help your child develop an enjoyment of typing that will encourage more learning.